You’ve probably heard the story a million times before – young band grabs some instruments, not knowing how to play them, and learn as they go. There’s a reason why that kind of narrative is focused upon in Cayetana‘s bio, though – it never fails to be awesome and inspiring. Screw waiting around until everyone knows how to play, just make some art. It’s that do-it, learn-it, release-it yourself ethic that oozes from both sides of Cayetana’s latest seven-inch Hot Dad Calendar. 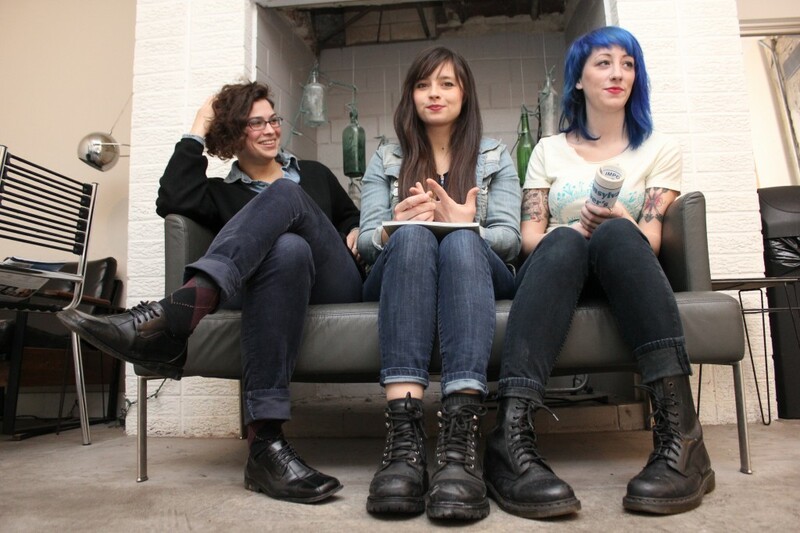 Hailing from Philadelphia, PA, Cayetana have been high-kicking around the music scene since their formation in 2011. Playing the kind of fuzzed-out indie-rock that I will always welcome with open arms, the title track drives along with driving drums, bouncy bass-lines and more than a few hooks. On the surface, comparisons to Waxahatchee and Laura Stevenson will sound apt, but you get the feeling from Cayetana’s songs that there’s something here only these three specific friends could create and release into the world. There’s also a refreshing lack of pessimism on the title track; I love wallowing through sad-sack songs as much as anyone, but when Augusta Koch sings “Kid, you’ll be OK / you’ll get better with age” while drummer Kelly Olsen and bass player Allegra Anka segue into an upliftingly catchy and beautiful bridge, it’s pop-music bliss that I can wholly get behind. After releasing some tracks through their Bandcamp page, Cayetana made the jump to the always reliable Tiny Engines label for the Hot Dad Calendar seven-inch. You can purchase the vinyl (in Light Blue, Mint Green, or Purple!) as well as stream both tracks right now through their online shop. I heartily recommend keeping your eyes on this band – I’ll be patiently awaiting a full-length from Cayetana, based on the strength of this seven-inch.